"Am I really never suppose to lounge into my couch ever again? I don't spend a lot of time there, but I can't imagine watching a movie upright, holding perfect posture. One, my back would kill me by the end. ;)"
Ah the couch. It's such a comfy, seductive, black hole to nestle into. I know, I know. You love it. You don't want me to ruin your couch experience!! 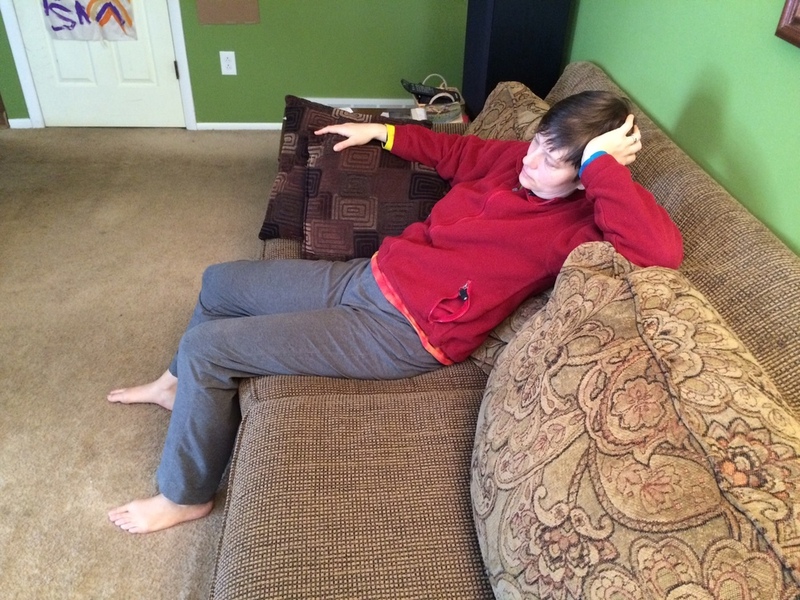 Here's the thing, your pelvis and your back don't love your couch. Consider this, your body adapts (muscles, joints, etc.) to the position that it's in the most frequently. Also consider that many, many basic body functions like blood flow and lymph flow (part of your immune system) rely on movement in order to work optimally. Your body wasn't meant to be parked in one position for any length of time. Chances are when you sit on your couch, you're sitting in some type of a cockeyed, tucked pelvis position, like one of these. Look familiar? However, if you don't spend a lot of time moving or you have pelvic floor disorder or pelvic instability or back pain (or some combination), then I would encourage you to find other ways to relax while watching TV besides becoming one with your couch. The good news is, you have options! Lots of options! And no, it doesn't mean holding perfect posture for hours because what fun would that be? Why? When you sit on the floor, you tend to change position more frequently which means you get more movement and use a variety of joint positions. You're also asking your muscles to actively support you (far more than when the couch is doing the bulk of the work). If you're new to sitting on the floor, don't expect to undo a lifetime of outsourcing your sitting support to a couch and chair by giving it up cold turkey. Do your body a favor and transition gradually. Not only are you asking your muscles to step up and work to support your body but you're asking your joints to move in different ranges of motion than they may be used to. It will take time for your muscles to build strength and endurance and it will take time for your joints to mobilize. Start with small doses and build over time. Three years ago I couldn't sit comfortably on the floor for any length of time without my back getting really achy and uncomfortable. Now I can easily sit on the floor without any discomfort. For tips on transitioning to sitting on the floor, watch this video. Pick one of the options below! *for details on this psoas release (photo bottom right), check out this blog post. Are you an experienced floor sitter or new to floor sitting? Share your thoughts in the comments!